After immersing myself for some time in a steaming bath full of rose-scented water with a book and a glass of merlot, I wrapped myself in a bath robe and padded into the kitchen to cook a quick and effortless dinner. 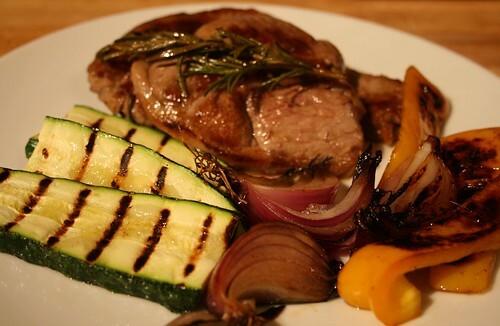 I took the lamb leg steaks from the fridge and marinated them in olive oil with fresh rosemary while I heated a griddle pan and sliced a courgette, red onion and yellow pepper. A brush of oil and in went the vegetables to char grill. 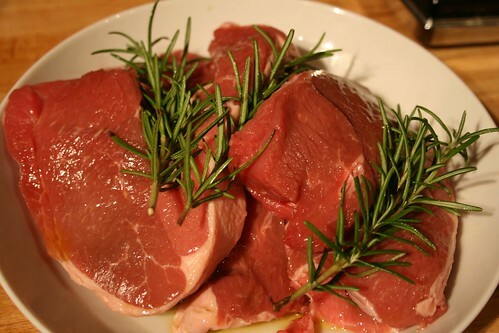 The lamb steaks went into another pan with the rosemary and oil from the marinade. Ten minutes later dinner was ready to go. Next Post In the Bag: Cooking the Month of May!